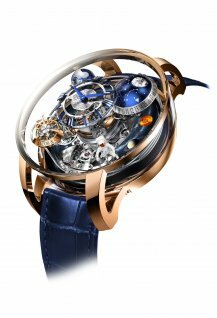 Jacob & Co. unveils a new Astronomia Maestro Gravitational Triple Axis Tourbillon Minute Repeater Carillon. 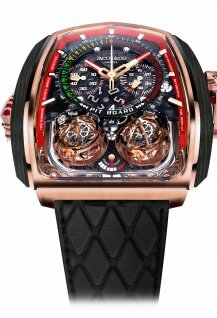 Only Jacob & Co. could have the audacity to present one of watchmaking’s most sophisticated complications in a transparent case that has, among many things, an astronaut floating around in it. 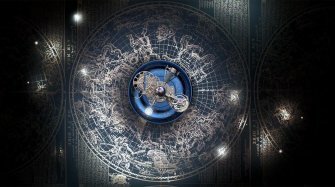 The Astronomia collection, which was the fruit of four years of work that combined the fantasy of Jacob Arabo with the talent of master watchmaker Luca Soprano, has always been clear – in both the figurative and literal senses – about our place in the cosmos and its unavoidable connection with time, the very reason we have timepieces in the first place. 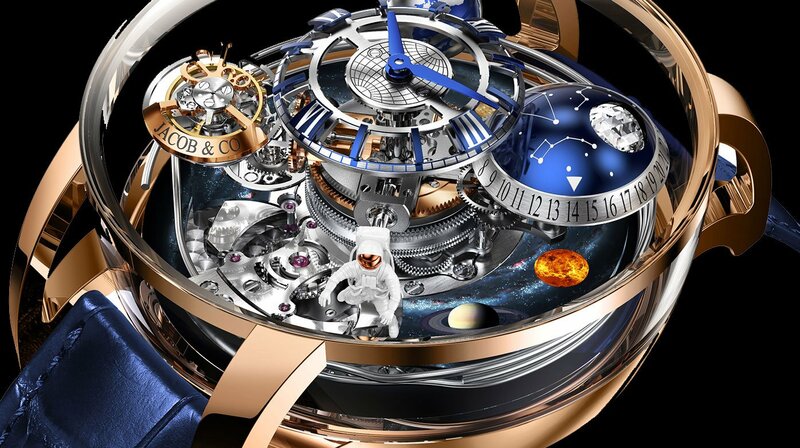 After pioneering the first-ever vertically constructed watch movement that constantly rotates about its own central axis, with branches attached that carry objects as varied as an astronaut, a Jacob®-cut diamond, the Earth and even an hour and minute dial, the duo behind the Astronomia have spent the past couple of years perfecting their latest horological marvel. The Astronomia Maestro incorporates a minute repeater mechanism with carillon – the most complicated type there is. What’s more, it does so with a patented fusée barrel with a ratchet and pawl system and with three gongs that are wound around the movement mainplate in a spiral – a first in watchmaking. 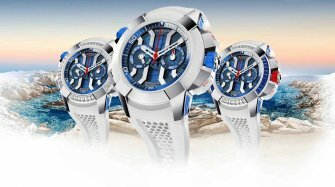 The result is an entirely new movement, which for the first time houses the hour and minute display centrally, rather than on one of the rotating arms. The arm that became available because of this has been given a moon phase display that rotates on its own axis in 31 days and displays the date on a scale and the moon phase using the rotation of a Jacob® cut diamond that is half black and half white and has 288 facets. 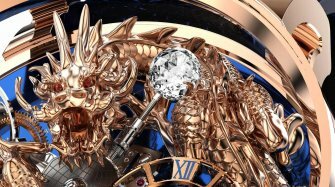 Although the visual aspect is breathtaking, minute repeater collectors will naturally be as interested as much in the acoustics of this piece as in its aesthetics. In this respect, the Astronomia Maestro has a lot going for it. For a start, the majority of its case is in sapphire crystal and is rather voluminous, which helps to amplify the sound. 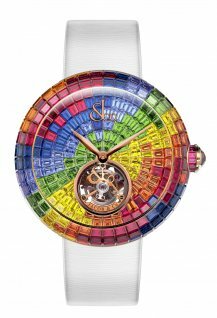 “The considerable volume allowed us to conduct extensive research over the past two years in order to go beyond the usual minute repeater principle,” explains Luca Soprana. Three clearly visible hammer strike out the hours, quarters and minutes from a low to high pitch with a fine cathedral gong tone. The audible symphony is accompanied by a visual ballet in which the four arms of the movement complete a full revolution of the dial every ten minutes. On opposing arms, the Earth and miniature astronaut (he is almost weightless at 0.2 grammes!) rotate on their axis every 30 seconds, while the tourbillon performs a full revolution every two and a half minutes, rotating about the balance wheel axis and its own axis every 60 seconds. All this happens against the backdrop of the planets in our solar system. 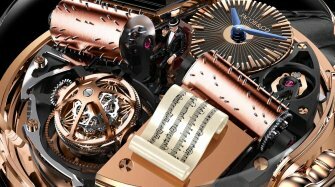 The Astronomia Maestro, with its manually wound JCFM06 calibre consisting of 608 components, is a strictly limited edition of just 18 watches. Jacob & Co. is an artistic visionary Maison that displays boundless creative freedom. Setting a completely new tone, both in terms of design and complications, it celebrates being different.